Complimentary Valet parking for those joining us at Butcher & Still. 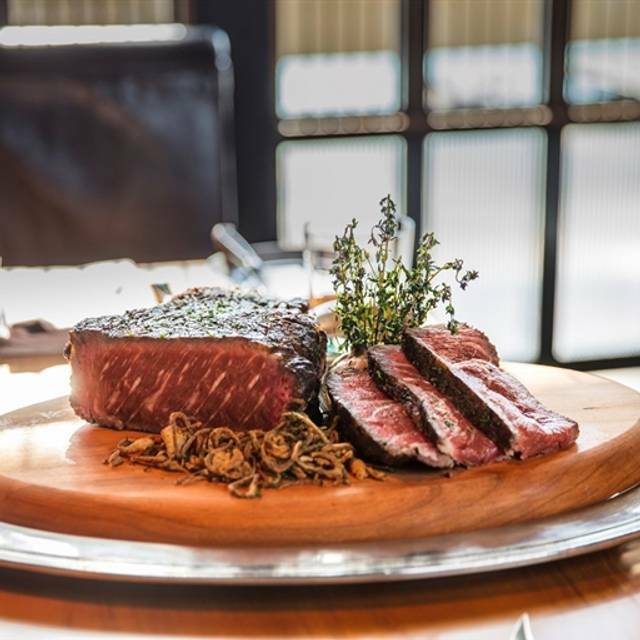 This award-winning authentic 1920's style Chicago steakhouse makes for the most unique dining experience in the capital. Dine on prime-cut steaks while enjoying views of the city’s waterfront. Superb restaurant, excellent food and wonderful service. Steaks were perfectly cooked and the cherry pie dessert was spectacular. Can highly recommend for a special occasion, particularly given somewhat high prices! Attentive and friendly service, great ambience and excellent prime quality steak with fantastic sides. Loved it, great place for celebrating a special occasion. Food was good. Staff struggled to understand English. Refilling my wine glass required a second member of staff to assist. Somelier was good and food was good. Ambience was average. Smoke comes through the main restaurant on busy nights. Music was very good. Excellent and personalized service! Highly recommend! A truly splendid restaurant in the Four Seasons Hotel Abu Dhabi. Lovely decor, I highly recommend sitting outside where you get lovely views of downtown Abu Dhabi skyline and the waterfront. 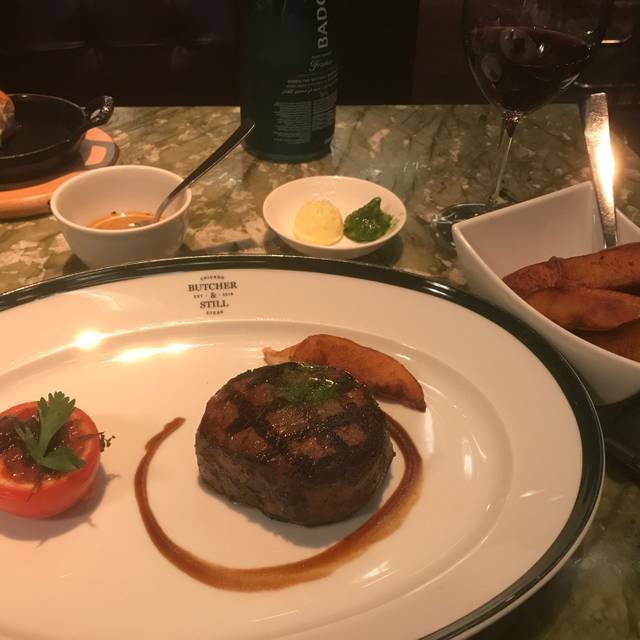 My husband and I were visiting Abu Dhabi for the F1 and Butcher and Still was highly recommended, so we saved visiting it until our final night in Abu Dhabi. What a lovely end to a fantastic holiday, the food was divine, full of flavour and lovely presentation. We were given Breadcrumbed Oysters to try by the chef as appetisers complimentary as well as home baked cookies to have with our tea at the end of the meal (nice touch). We requested tea and although it wasn’t on the menu, Butcher and Still were happy to accommodate. Staff were excellent and extremely knowledgeable on the menu and were able to answer all our culinary questions! Great food, perfect setting and exceptional standards of staff - worth every Dirham! Decent good steakhouse. Posh decorations in a high end hotel. Situated next to the waterfront. Very nice views. Food wise its reasonably good. With very good portion. Nothing much to fault. Service wise, we felt that they lack the personal touch. We were there for birthday and anniversary celebrations but we didn't see or hear any well wishes or any celebratory desserts. Most high end places we went do will have something special arranged for us. Ignored for half an hour after being seated, so we left without eating. For a restaurant that commands such high prices one would imagine the service to be impeccable? Sadly they fell far short of our expectations. The first time i visited the resturant the food was amazing. My last visit on thursday wasnt that great . The service was not as expected, and the food was average and my steak wasnt how I ordered it. The chocokate cake was very dry, i was very disappointed after i raved about it to my friends. Overall, my second visit was not how i expected to be. Visited for Mother’s birthday with the family and were ignored when a larger table arrived. Far too expensive for what you get. Simply one of the best steak restaurant in Abudhabi . All steaks are finished on charcoal grill which gives it a real barbecue finish unlike resturants which you excessive amount of butter on a pan/griddle . This resturant is worth a try , the chef is an amazing person who really understands the science behind butchery and beef cuts. The food was high quality and delicious. It was quite expensive but for a special occasion worth it. Great service and great food but extremely expensive - however, when I booked for a special birthday, I was not told that the 2 4 1 drinks offer was suspended! This was acknowledged by management but could not be rectified. Come on guys, this is not difficult and makes for a bitter experience. I use you restaurant regularly - I will think twice in future!!!!! Extremely expensive. Very good steak, but it costs twenty times more than if you buy a good stake from the butcher and cook it yourself. Quiet simply the best burgers ever! We arrived just in time for Happy Hour and fell in love with the well made hand crafted cocktails. The smoked Manhattan was excellent. The ambiance is lovely with an authentic speakeasy vibe, all the way down to the vintage music playing inside. 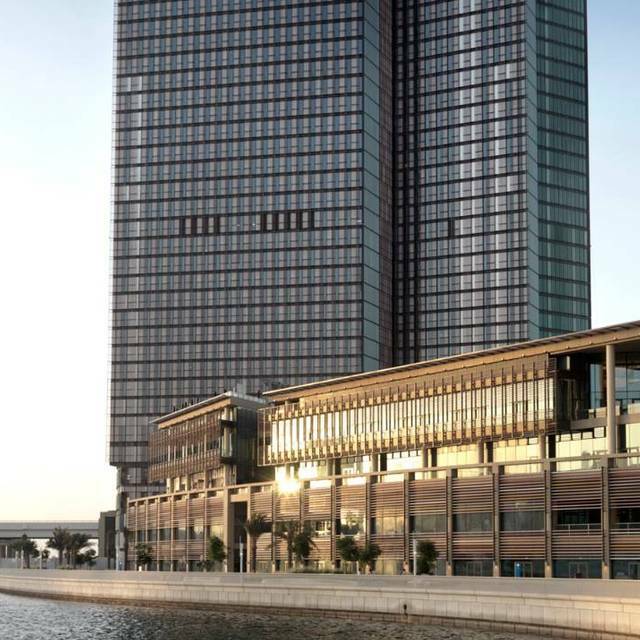 Glass doors slide out of the way to open the bar up to the beautiful waterside terrace and the view back to Abu Dhabi. Our steaks, sides, and fresh raw oysters from France were all exceptional. Thanks to chef Marshall Roth for an extraordinary evening and a fantastic dinner. I was craving a good, flavorful steak and what we received was masterfully prepared. Never heard about Butcher & Still ... but from now I'll keep it in my mind. The food was great, very tasty steaks. I just wish they have made more of a scene when they bought the birthday cake. Like for example, gathering 3 staff and singing "Happy Birthday" not just bringing in the cake and saying HBD in a low tone. The restaurant was empty so there was no atmosphere. Our food came out very quickly so not much of a break from the starter to the main meal. Due to this we had finished within an hour. The price of the food was extortionate for what we got. Then on top all the taxes you have to pay. We would not return just for this reason. Excellent food, very attentive service by our waiter Max, who catered to our every need. To die for “key lime pie” dessert. Cannot fault this place. Was great place and nice atmosphere as well great food. Specially the quality of meal! The service is very gentle and professional. Not a classic steak house more of a high end pub. Service was good to overwhelming. Wine list is very overpriced. The food, atmosphere, service and wine was amazing. Michelin star quality and would most defiantly go back on our next visit to Abi Dhabi. It's arguably the best place to eat period. We're back in the UK now, but will searching for their presence in the UK. Simple brilliant. Made our anniversary weekend. We have been to Butcher and Still a number of times. Staff is exceptional. Chef Marshall knows how to run a kitchen. Steaks come out as you request! USDA quality beef...no other restaurant does it like them. 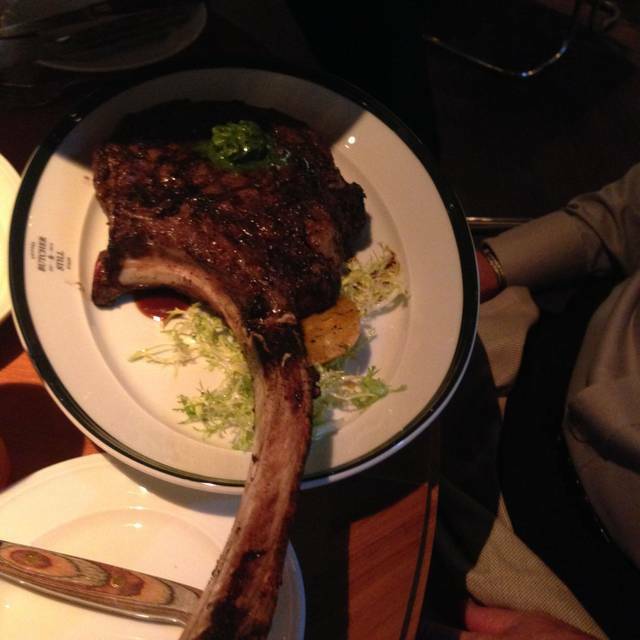 The tomahawk steak is a must! If you love steak, you'll love the Butcher and Still. Some of the best beef in the world. They also know how to make a drink! Well worth a visit. 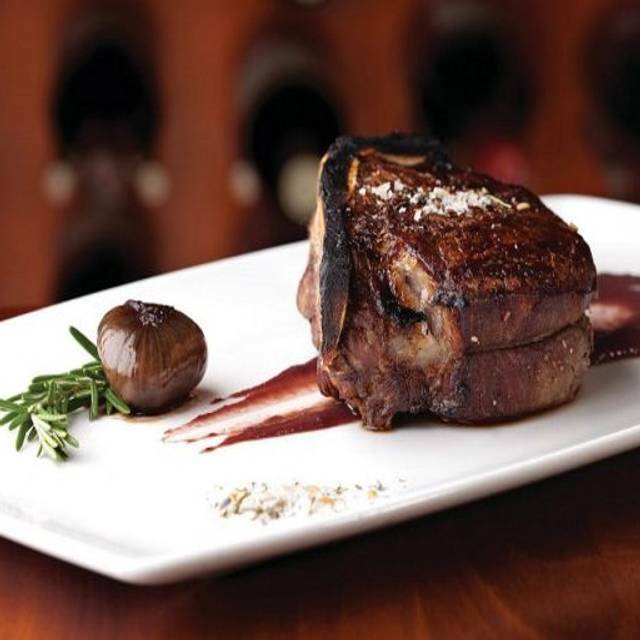 Great spot with outstanding steaks, perfectly prepared and very flavorful! Great restaurant - fab vibe and wonderful food. Service was sublime and fabulous decor. I guess I am a bit spoilt and found the prices a bit eye-watering. I am never one to shy away from paying for a good meal and location, although this was just a bit over the top. Would I go back? Of course... when I win the lottery next! Visited Butcher & Still the first time and was extremely happy. 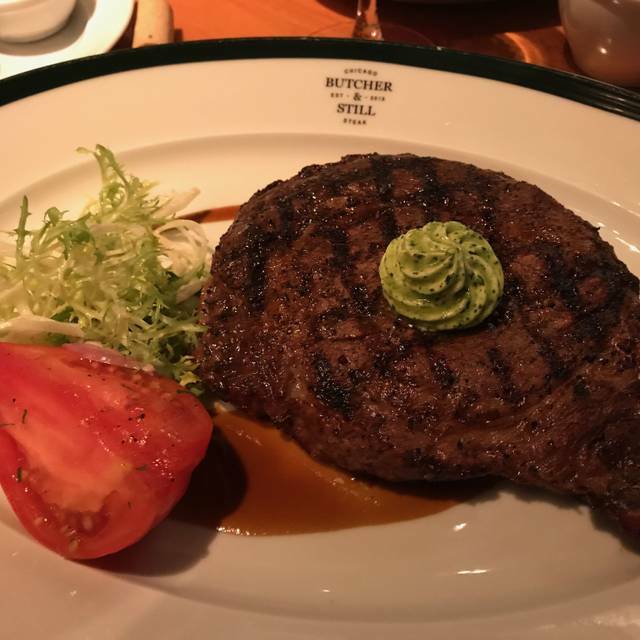 My Ribeye Steak was cooked to perfection (Medium Rare), great meat quality very tender and all sides we ordered were excellent too. Also enjoyed the Cherry Whiskey Sour cocktail we had at the bar on recommendation from bar staff. Will be back. Well done! Great Steak, awesome chef and very good service. Would recommend the restaurant and bar to anyone! Great food and nice to see the chef taking a real interest in diners for their feedback. we will definitely be back soon. A must for fans of juicy red meat! Chef Marshall and his staff put together very tasty plates. In addition to the reason for dining (steak) all things baked..from the bread to the pie crust taste amazing. What a wonderful dinner and experience. Chef Marshal was amazing and so was our wonderful waiter. I will be back to bring all of our clients. Awesome food and atmosphere. The staff was amazing. Thanks for an awesome experience.